But injustice two generations old was not a big enough hook to hang a thriller on. 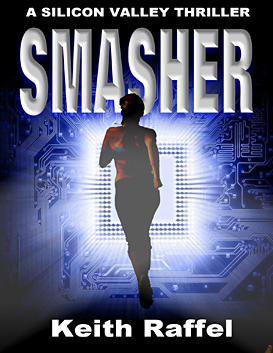 I also wanted to infuse Smasher with some of what I’d experienced – as a child and an entrepreneur – in Silicon Valley. How the Valley operates reminds me of the scene in The Godfather where a gangster excuses a murder by saying, “It’s not personal, Sonny. It’s strictly business.” Here in the Valley, “it’s strictly business” justifies almost anything. If there’s a chance for an investor to extract some more shares of stock from the founder of a company, go ahead-- it’s business. If one corporate director hires a private investigator to spy on a fellow board member--well, that’s business, too.